Mike Philippov: Hi, this is Mike Philippov from PracticeGuitarNow.com and today I'm bringing you another exclusive interview on how to practice guitar effectively. 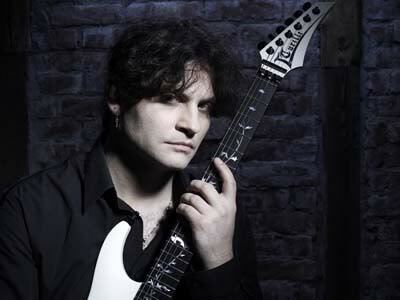 I'm speaking on the phone today with Luca Turilli, one of the founding members of the epic metal band Rhapsody Of Fire. Luca is very well known and respected in the guitar world for his great Neoclassical guitar playing and composing, so today I'm very happy to have him on the phone with me to share some of his secrets about practicing guitar. Welcome Luca, it's great to have you here! Luca Turilli: Hi to everybody! It’s a great honor for me to be interviewed by my friend Mike! MP: What would you do differently if you had to start learning to play guitar all over again in order to reach the skill level that you have reached in less time? LT: Well, for sure I would change the year of my birth. Because nowadays it is much easier to reach the level that you want to reach as a guitar player. So I think I would like to encourage all guitarists who are aspiring to become really good to find out about all the great guitar playing courses and internet guitar tab that you can get everywhere nowadays. Because it is just amazing today compared to back at my time. When I was young, there were no such possibilities. I remember the time when I bought my first guitar tab (it was the Rising Force album of Yngwie J. Malmsteen), and to have “something” in tab was a miracle. Right now, finding guitar tab is so easy with guitar notation programs such as Guitar Pro and it’s amazing because you don’t have to lose time like I did so much in the past to write (transcribe) the tab of the music that I wanted to play. For example, I remember when I was 16 years old in 1988-1989 and I discovered my love for the guitar and the passion for this great instrument. I really started transcribing all the caprices of Paganini, all the sonatas of Bach and others. So I was spending more time doing the transcribing than I did actually playing the music on guitar. Now you can find everything you want on the internet and on YouTube and this makes the learning process much easier. MP: How do you practice guitar to prepare for recording in the studio? What is the general practice approach that you might use to prepare yourself for playing guitar in the studio environment? LT: I can tell you that right now I don't really need to go into the recording studio to record guitar. Nowadays I think you can easily record it (the music) on your computer and then send the finished files into the studio. This is a big advantage because of course it is nice to record in the comfort of your home as opposed to going to another studio like I used to do in the early years. I remember the first years (of recording in the studio) and there was a lot of emotion, but in the end when they press the recording button, you have to start playing, so you have to put the emotion aside and concentrate on what you want to record. Of course I remember that the first experiences were shocking a little bit. I remember the first time I entered the studio in 1997 to record an album professionally and that was quite funny. Since I didn’t go to school to learn about guitar playing and I learned everything myself, one thing I didn’t know was that there was a difference between playing the low strings on the guitar with palm muting vs. playing them open (without palm muting). So when I started to record this very fast rhythm in the speed power metal style, I was playing the strings without palm muting and the producer was looking at me strangely because I didn’t even know what palm muting was - it was very funny and strange/embarrassing. So then I had to accelerate (improve) everything for the second production, when I had to really concentrate on all the techniques that are extremely important when you record professionally in a serious studio. And of course, for many guitar players it is the same as they have to face some traumatic studio recording experiences but such moments will only help you to improve. MP: How does your guitar practice approach differ when you are preparing for a live show or a concert? What are some of the things that you do to practice for preparing yourself to play guitar on stage? LT: I usually take 20 minutes before the show to replay all the guitar solos from the songs that I have to play on stage. This is something that I need to do before facing my live concert, because my memory maybe is not good enough since I'm concentrating on so many things. This helps the music to not only be absorbed by my brain but also to be absorbed by my fingers and my hands. I don’t think that I can go on stage without practicing guitar at all and just begin to play. However, this happened before because sometimes when you perform, especially at festivals, you never know when you have to enter, so you have to be ready quickly and sometimes you cannot decide that you will have 20 minutes to rehearse. So you may have just 5 minutes to review your most difficult guitar solo. I start of course by reviewing the most difficult guitar solos to absorb them in my hands and if I can play them through even one time, then it’s great to go on stage because I feel ready. MP: When you practice guitar at home, what are the steps that you take to solve your guitar playing problems? So when you are faced with a difficult section of the music, such as in a guitar solo for example, what are the steps that you take to improve those difficult areas of the music? LT: Well, this is what I think is typical for the guitar player who wants to learn something. I think that I isolate the guitar lick or the part that gives me many problems and I try to really work hard on that. After I have solved the problem, then playing that part feels different (easier). This is always like this, especially since I love to play a lot of classical pieces and I always find that in every 3-4 measure section there is one part that is more difficult to play than the rest. So for sure you have to approach things in this way (by isolating difficult areas) because otherwise you start playing the music at a certain metronome tempo and then you must slow down when you face the problem section. So if you want to one day start playing everything at the same consistent tempo with good results, you have to at first slow down the speed and do the typical things that every guitar teacher suggests to do to guitar students. So I take the most challenging guitar part and play it 10 times more than the others until it becomes much easier for me. MP: What do you think makes you different from all the other guitar players who also wish to reach a high level of guitar playing but are having a hard time improving their musical skills? LT: I think that I need to make a distinction in this case between “composition” and “execution” (performance). For example, in my case I wanted to become a guitar player so that I could COMPOSE the guitar solos that I liked to hear. Many other guitar players want to learn to play just because they love the guitar and thus they become more like “executors” (performers). So in my case, giving priority to the composition has made the difference. For me, I think that I became more famous because of the songs and the guitar solos I composed. So I think that if we check the statistics, they will show that one has a greater chance of becoming famous for their compositions than for their execution (performance) of music. This can be proved by going to YouTube where there are thousands of guitar players playing guitar fast and perfectly, but in the end they are just “there” (in their bedroom), showing off their guitar playing skills and we never hear about one of their guitar solos in an album. This might be the problem. I think the people in general feel more reward (enjoyment) when they listen to a great sounding guitar solo than when they see a person showing off their guitar playing skills. So I think this is very important, however I also think that guitar players need to LOVE the process of becoming better musicians and being able to play great guitar solos that everyone can appreciate. I think that this is the main thing that makes myself different, because I developed in a particular style and because I admired great guitar players such as Jason Becker and Marty Friedman of Cacophony, Malmsteen and many others of the Neoclassical age. Of course, if you asked me to play jazz, the result would be something else, because I never developed the particular skills in that style. So this is what I really suggest to every guitar player: find your own musical style, and instead of becoming a great “executor” (performer) and going faster than the speed of light, work to develop a great taste of how to compose music, so that one day, sooner or later you can show off the album you recorded. MP: How do you keep your mind focused when you practice guitar for long periods of time so that you continue to remain effective with your guitar practice time? LT: Well, this was a big problem for me, especially in the beginning. When I used to play guitar 8 hours per day only to develop the basic guitar playing skills, it was very hard on many days to keep practicing for so many hours when I couldn’t see my fingers becoming any faster. Also, it was hard to experience the disappointment of playing guitar exceptionally well one day and expecting to play even better on the next day only to find that you actually play worse than the day before. In my case, I discovered that I need a lot of “pauses” (breaks) in between the various areas I'm practicing. I cannot play guitar for 8 hours nonstop, because if I try, my hands begin to sweat and I go into a stress mode in my mind and brain. So I take breaks every hour or every 30 minutes when playing guitar for 8 hours during the day. But now, it’s easier than before because after you develop a set of basic skills, then you can have a lot of fun while practicing guitar. This is my case now, because there is no “practice” for me anymore, and instead I play for fun the classical compositions of the great artists like Bach, Chopin etc. And of course year after year and I can face (play) more difficult guitar parts and this is the great reward. So you can think of this as the second phase of your life as a guitar player. In the first phase you have suffer a little bit and visualize your goal as the most important thing, and just concentrate on the fact that you want to reach that level one day. MP: What is the approach that you use to practice "memorization" of songs and guitar solos? When you practice guitar, how do you make sure that you don't forget your guitar parts? LT: First of all, I use the great guitar notation software called Guitar Pro. It’s very difficult for me to forget something because whatever I create (for example for my band) I always write it down (or tab it) immediately. And this is great, because if I don’t do this for even 2 days, I will lose (forget) it immediately. This has happened for many, many great guitar solos that I created in the past and then waited for some time to write them down before they were lost. So it is important to use such software for people who have problems with memory (or remembering musical parts). For me actually memorization is made easier by the fact that I treat guitar solos like real songs. For me, a guitar solo is not just a normal typical lead guitar improvisation, which I have to admit I do not like so much in general. Some guitar players really amaze me even while improvising, but many others do not. I prefer always this kind of prepared, big guitar solo and I create them in the same way as I compose a song: so that they have a main melody, then there is something varying (changing) and then the guitar solo comes back to the main theme. So I treat them like compositions, and because of this there are elements that your brain can connect to. It’s very easy to memorize your guitar solos when you have this kind of structure. With improvisation, frankly I couldn’t memorize all the guitar parts. MP: Looking back on your years of learning to play guitar, do you feel that the amount of time that you spent practicing and playing the guitar each day had a significant impact on you developing the great guitar playing skills that you ultimately developed? LT: Yes, absolutely. The more you work, and the more you dedicate yourself to your work with passion and effort, then in some way you will achieve the result sooner or later. Of course you cannot hope to become a great guitar player if you dedicate yourself to it for only one hour every week. In my case for example, I started to play guitar very late - when I was 16 years old. I remember the time and the first push given to me by the artists that I was listening to (such as Yngwie Malmsteen), and experiencing those great Neoclassical albums. This was the force pushing me to play guitar 8 hours per day. Of course I was thinking and living for the instrument. And so of course this gave me the possibility to develop the basic (guitar playing) skills that allowed me to compose my first songs with my band Rhapsody Of Fire, so it was fundamental. Right now I don’t play guitar so much, because I dedicate most of my time to composition. For me, this (composing) is the most important aspect of my being an artist. At one point I found myself “in a hole” as a guitar player when I was not really playing the instrument and only picked it up for a few minutes before live performances. This went on for 3-4 years and after that the passion came back. In a short time I recalled everything that I knew before and developed immediately a step further (speaking about the technical guitar playing ability). So I think sometimes it’s not so bad to have a kind of “crisis” (break) from guitar playing, but not for too long! MP: Do you think that it is better to learn and practice guitar in a variety of different musical styles, or is it better to specialize in a narrow musical niche? LT: I think it depends on what you want to achieve as a guitar player, such as if you want to become a session man or if you want to create your own band with your own guitar playing style. So you have to find a compromise because it’s very difficult to play many different styles of music. So of course you follow the passion of your favorite style and you automatically specialize and do it. Of course speaking about me, I am totally in love with the Neoclassical stuff, even now after 20 years. For example, I'm not playing at all in blues or jazz styles which are both based on improvisation. So in the end I would say that in my case it was much more useful not to learn different styles but to learn to play a different “instrument”. This is what I strongly suggest to every aspiring guitar player. When you are able to play the guitar and at the same time you are also able to play something on the piano, it is just amazing, especially if you compose music. When you compose starting from the keyboard or the piano, you will do so in a different way than you approach this process on the guitar. Otherwise you tend to repeat yourself after many years, especially if you are in this business and are releasing one album after the other. So it’s always better to learn more than one instrument. MP: When you were learning to play guitar back in your earlier years, where did you find the motivation to practice guitar for so many hours every day over such a long period of time? LT: Well, this is an important question. Without knowing it, I was using the “visualization” technique. Nowadays everybody is teaching it as something new, but in the end some people are doing it also without knowing about it. It’s something that you have inside. In my case, I had this kind of big energy - a big force that keeps you at home when your friends go out to the disco or to find girls or whatever. When you put all your passion and energy into something, the hours pass very fast and it all depends on the way you face them (what you do during your guitar practice time). If you practice guitar in a boring way, then after 2 months you will pull your instrument apart and you will not play anymore. However, if you really approach it with natural force, energy and passion, then everything becomes easier. I remember in the early years when I was not even able to play one sweep on the guitar and at the same time I was listening to the album of Yngwie J. Malmsteen with his great interludes such as the one from “As Above So Below”. I was loving the sound coming from the album so much, that I was always visualizing myself playing it as if I were Malmsteen. I was thinking about being on the stage in front of people playing those guitar parts, and I was feeling like the guitar was my big epic weapon and it was just amazing to be in that situation. And without knowing itb I was already creating and moving that energy that would one day bring me to a real stage. MP: Okay, that about wraps up all of my questions for today. Thank you very much for your answers Luca, you have shared a lot of great insights about how master guitar players such as yourself practice guitar , and I am confident that anybody who hears this will be very inspired to apply these ideas in their own practicing to make their guitar playing better. So thanks again Luca and all the best in your music career! LT: Thank you my friend, it was a great pleasure for me to do this interview with you. I really hope that some advice will be taken by aspiring guitar players because it’s great when you have the possibility to share your experience after so many years and this can be helpful for other people. Get the very best training on the most effective guitar practice methods.